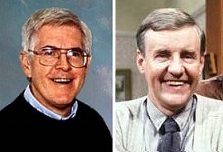 Richard Horsley and … Richard Briers | Amazing Lookalike! On the left is Richard A. Horsley, Distinguished Professor of Liberal Arts and the Study of Religion at the University of Massachusetts, Boston. On the right is Richard Briers, who played Tom Good in the BBC sitcom The Good Life and Martin in Ever Decreasing Circles.